Other Chinese Names: Fei-yang ts'ao, Ta fei-yang, ta nai-chiang ts'ao, ju-chih ts'ao (milk herb), ta-ti chin, ta ju-chih ts'ao (giant milk herb). BENGALI: Bara dudhe, Baro kherui, Baro kheruie, Barokhervi. CHINESE: Fei yang cao, Ru zi cao, Fei xiang cao, Fei-yang ts'ao. GUJARATI: Dude, Lal-dudhi, Dhedi dudheli. KANNADA: Achchegida, Acchacche gida, Acche gida, Haaluni,Kempu nene akki. MALAYALAM : Nela-palai, Nelapalai, Nilappala. MARATHI : Dudhi, Mothidudhi, Dudali, Dudnali, Govardhan, Mothidudhi, Motidoodhi. SINHALESE: Budakiriya, Dadakiriya, Kepunkiriya, Kirithala. SPANISH: Golondrina, Hierba de boca, Lecherón chico, Lecherita, Pichoga, Yerba de sapo. TAMIL: Amampatchaiarisi, Ammāṉ pachchaṟisi, Cittirappaalaatai, Pachchilai, Sitrilai pālāvi. URDU : Doodhiklan, Dudh khurd. Euphorbia is the largest genus of the family Euphorbiaceae with about 1600 species. All species of Euphorbia exude a milky juice when broken, and Euphorbia hirta's local name "gatas-gatas" derives from this. Gatas-gatas is a slender-stemmed, annual hairy plant with many branches from the base to the top, the branches simple or forked and ascending or spreading, up to 40 centimeters tall, reddish or purplish in color. 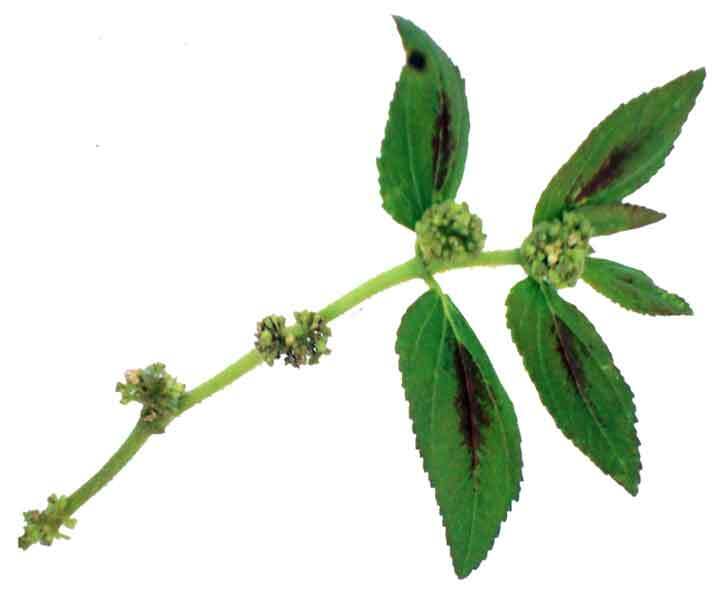 Leaves are opposite, elliptic-oblong to oblong-lanceolate, distichous, 1 to 2.5 centimeters long, usually blotched with purple in the middle, toothed at the margin. Involucres are numerous, purplish to greenish in color, borne in dense, axillary, stalkless or short-stalked clusters or crowded cymes, about 1 millimeter in length. Capsules are broadly ovoid, hairy, three-angled, about 1.5 millimeters long. - Abundant throughout the Philippines, in waste places, open grasslands, etc. - Studies have isolated gallic acid, quercetin, triacontane, cetyl alcohol, phytosterol, phytosterolin (phytosterol glucoside); jambulol, melissic, and a mixture of acids consisting chiefly of palmitic, oleic, and linoleic acid. - Phytochemicals screenings have yielded alkaloids, essential oil, phenols, sterol, flavones and fatty acids. - Yields flavonoids: euphorbianin, leucocyanidol, camphol, quercitrin and quercitrol. - Study has suggested that some of the constituents of the plant are similar to those of the jambul (Syzygium cumini) seeds. - Considered anti-asthmatic, antibacterial, antidote, antifertility, antifungal, antimalarial, anti-spasmodic, anthelmintic, antidysenteric, diuretic, expectorant, pectoral, hemostatic, sedative, soporific. - Studies have suggested antibacterial, antidiabetic, hypolipidmic, anti-inflammatory, anti-asthmatic, diuretic, anthelmintic, antiallergic, antihypertensive, antidiarrheal, galactogenic, anxiolytic, sedative, antitumor, molluscicidal, antimalarial, antioxidant, immunomodulatory, antidengue, antiviral, platelet increasing, antiarthritic, cardioprotective, antipsoriasis, wound healing properties. Entire plant, latex, leaves, roots. - Called gatas-gatas because of the healing property of the milky juice. - In the Philippines, leaves are mixed with Datura metel leaves and flowers in the preparation of "asthma-cigarettes." - Latex is prescribed for asthma. - Entire plant prescribed as an antidote; considered hemostatic, sedative, and soporific. - Decoction used to allay the dyspnea of asthmatics. - Fluid extract of tincture is used in asthma, chronic bronchitis, and emphysema, also in pulmonary cardiac disease and angina pectoris. - Used for acute and chronic dysentery. - Tincture is used as anthelmintic. Also used for ringworm. - Juice used for colic. - Juice used as ophthalmic drops for conjunctivitis or ulceration of the cornea. Stem sap used in the treatment of styes. 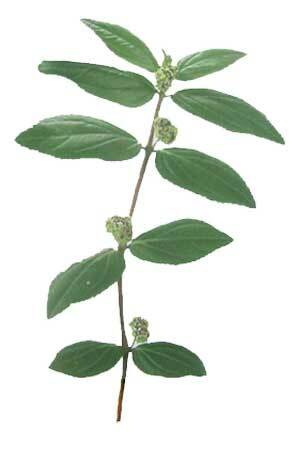 - Leaf poultice used for swellings and boils. - Infusion or tea of the plant, 4 glasses daily, for bronchitis and labored breathing, asthma, chronic dysentery. - Used for boils and wounds. - Decoction of dry plant used for skin disease. - Decoction of fresh plant used as gargle for the treatment of thrush. - Decoction of the root used to allay vomiting, chronic diarrheas, and fevers. - Root decoction also beneficial for nursing mothers deficient in milk: 4-5 glasses of tea. - The same root decoction as an enema for constipation. - Root used for snake bites. - Used in sores, wounds, boils. As ear drop for pustular swellings in the ear. - Leaves are mixed with Datura metel leaves and flowers to make the "asthma-cigarette." - Superficial bleeding: Crush leaves and apply on affected part, as local hemostatic. - In Australia and elsewhere, used for asthma and pectoral complains. - In Brazil, decoction used for gonorrhea and asthma. - In Africa and Australia, used to treat hypertension and edema. - In India, used for treatment of syphilis; sap applied to warts. Also for affections of children, especially bowel and chest complaints. The milky juice is dropped into eyes for conjunctivitis and corneal ulcerations. - Plant decoction: 25 gms of the whole plant to a pint of boiling water; boil for 3-4 minutes; drink 3-5 glasses a day. Externally as needed. - In traditional Indian medicinal systems, leaves used in the treatment of coryza, cough, asthma, bronchial infections, bowel complaints, helmintic infestations, wounds, kidney stones and abscesses. - Santals use the root to allay vomiting; also, used by nursing mothers with deficient milk supply. - In the Gold Coast, ground and mixed with water and used as an enema for constipation. - In La Reunion, used as astringent in chronic diarrheas and dysentery. - Roots used for intermittent fevers. - Dengue and anecdotal reports of "cures" from the use of tawa-tawa has created a flurry of queries, web blogs, and sustained media interest. - Sip 1 to 1.5 glasses of Tawa Tawa water every hour. - Cut roots off 5 to 6 gatas-gatas plants. - Rinse. Put the tawa-tawa into a pot of boiling water for one minute. - Prepare 100 grams of fresh whole plant including roots. - Wash and boil in 500 cc of water for 15 minutes. Cool and paper-filtrate. - Drink a glassful of decoction every hour until fever subsides. • Antibacterial: Study on the antibacterial effect of compounds extracted from C sinensis and the methanol extract of E hirta against dysentery causing Shigella spp showed the extracts to be non-cytotoxic and effective antibacterial agents. • Antibacterial: Methanolic extract inhibited the growth of S. aureus, E. coli, and B. subtilis. Phytochemical screening yielded terpenes, tannins, alkaloids and flavonoids. • Anxiolytic / Sedative: Study validated the traditional use of E. hirta as a sedative with anxiolytic properties. • Galactogenic: E hirta study in female guinea pigs increased the development of mammary glands and induced secretion. • Antifertility: E hirta has been shown to decrease sperm motility, density of cauda epididymal and testis sperm suspension with 100% infertility. • Anticancer / Antiproliferative: (1) Studies of extracts of E hirta have shown selective cytotoxicity against several cancer line. (2) Extracts screened showed anti-proliferative activities against normal mouse fibroblast cells. (3) Study of a methanol extract of leaves of E. hirta on Hep-2 cells from human epithelioma of larynx showed anti-proliferative activity. • Antioxidant: Study of various extracts of leaves showed potent in vitro antioxidant activity. Total antioxidant activity was higher in an acetone extract compared to alcohol extract. (30) Studies of methanol and water extracts showed antioxidant activities comparable to that of green and black teas. • Anti-Inflammatory: n-hexane extract of aerial parts and its main triterpene constituents showed significant and dose-dependent anti-inflammatory activity. • Acute Toxicity Study: Study evaluated the acute toxicity of Euphorbia hirta plant material in Swiss mice. Results showed no toxicity at a dose of 10 g/kbw. E. hirta was found safe, with no delayed toxic signs in all experimental groups. (27) Acute toxicity study showed the toxic dose may be above 3000 mg/kg. - Tea, candied or capsules in the local market. Behavioral and neurotropic effects of aequeous extract of E. hirta / Lanhers Marie-Claire et al / Medicaments et aliments / Actes du Colloque Européen d’Ethnophmacologie et de la 1 le Conférence internationale d’Ethnomédecine, Heidelberg, 24-27 mars 1993. Antidiarrhoeic activity of Euphorbia hirta extract and isolation of an active flavonoid constituent. / Galvez J et al / Planta Med. 1993 Aug;59(4):333-6. Evaluation of antidiabetic activity of Euphobia hirta Linn. in streptozotocin-induced diabetic mice / Sunil Kumar, Rashmi and D Kumar / Indian Journal of Natural Products and Resources, Vol 12, June 2010, pp 200-203. A molecular pharmacology study into the atory actions of Euphorbia hirta L. on the LPS-induced RAW 264.7 cells through selective iNOS protein inhibition. / Shih NF, Cheng YD et al / J Nat Med. 2010 Jul;64(3):330-5. Antiviral activities of extracts of Euphorbia hirta L. against HIV-1, HIV-2 and SIVmac251. / Gyuris A, Szlávik L, Minárovits J, Vasas A, Molnár J, Hohmann J. / In Vivo. 2009 May-Jun;23(3):429-32. Sorting Euphorbia names / Authorised by Prof. Snow Barlow / Maintained by: Michel H. Porcher / MULTILINGUAL MULTISCRIPT PLANT NAME DATABASE / Copyright © 1997 - 2000 The University of Melbourne. 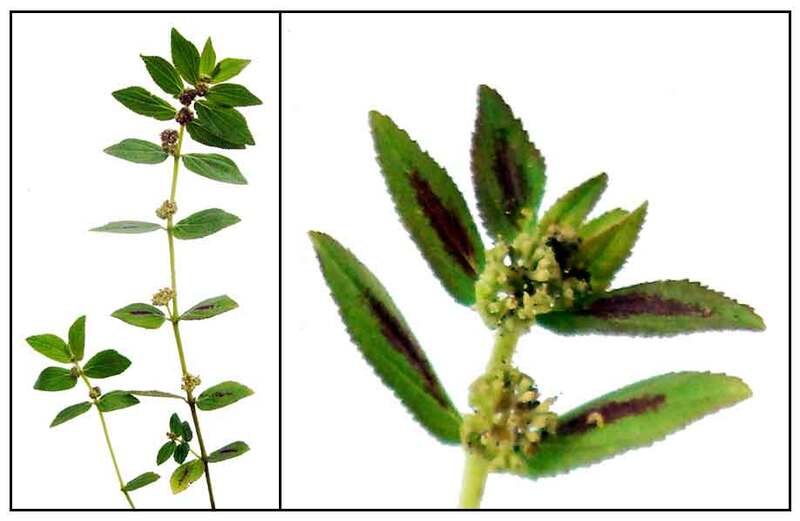 EVALUATION OF ACUTE TOXICITY STUDY FOR EUPHORBIA HIRTA / Shirish S Pingale / International Journ of Bioassays / Vol 2, No1, 2013. Antidiabetic and antioxidant potentials of Euphorbia hirta leaves extract studied in streptozotocin-induced experimental diabetes in rats. / Subramanian SP1, Bhuvaneshwari S, Prasath GS. /Gen Physiol Biophys. 2011 Sep;30(3):278-85./ doi: 10.4149/gpb_2011_03_278. Protective potential [correction of potencial] of Euphorbia hirta against cytotoxicity induced in hepatocytes and a HepG2 cell line. / Brindha D, Saroja S, Jeyanthi GP. / J Basic Clin Physiol Pharmacol. 2010;21(4):401-13. Euphorbia hirta accelerates fibroblast proliferation and Smad-mediated collagen production in rat excision wound / Aadesh Upadhyay, Pronobesh Chattopadhyay, Danswrang Goyary, Papiya M Mazumder, Vijay Veer / Pharmacognosy Magazine, 2014, Vol 10, Issue 39, Pp 534-542.